If you want to be a part of the contemporary pop-culture and send your SMS or Tweet the shortest and the most stylish way, you should definitely get acquainted with the OMG Texting Dictionary app. It represents a companion app ﻿to author Shawn Marie Edgington’s new text message pop-culture book in this years Academy Award Swag bags, “Read Between the Lines: A Humorous Guide to Texting with Simplicity and Style”. 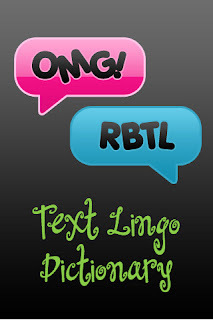 The app offers thousands of text abbreviations for creating shorter and smarter messages. It will also help you to guess what your friend is writing about when using a texting terminology. You can even choose the most distinguishable term and share them with others on Facebook or Twitter. OMG Texting Dictionary is so cute that it's going to be included in this year's Academy Awards SWAG bags. Thus all the celeb Tweeter followers will have a good chance to understand their idols' new stylish statements. The application has been developed and designed by Clever Twist, a popular mobile development shop out of Atlanta, Georgia. It is compatible with iPhone and ipod touch and requires iPhone OS 3.0 or later. The OMG Texting Dictionary costs $ 0.99 and you can download it directly from the iTunes App Store in the Social Networking category.